Baby’s rewarded with fun songs and sounds when she bats at the “magic” wand, a great first introduction to cause and effect! When your little one is ready for walking the Princess Stroller is there to provide steady support and fun music! The wide, stable base and easy to grasp handle helps provide steady support for baby’s first steps while sweet music and lights accompany your little one as they stroll along. A press of the "magic" wand button rewards baby with songs and fun sounds. 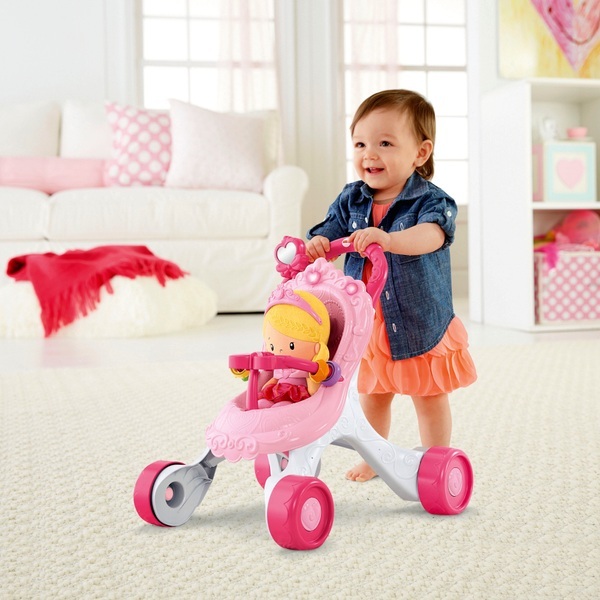 The Fisher-Price Princess Stroll-Along Musical Walker and Doll Gift Set also includes a Princess Chime Doll!